A first in the world of portable measuring arms: The ROMER Absolute Arm features absolute encoders and is therefore the first measuring arm which does not require referencing before measurement. When the arm is turned on, it’s ready to go. Quality control, inspection, on-machine verification, reverse engineering, virtual assembly or 3D modelling. Wherever these needs arise, you will find the ROMER Absolute Arm. Much more than just a metrology tool, its value lies in its versatility. Portability, stability, light weight and high-performance laser scanners make the ROMER Absolute Arm an all-purpose 3D measurement, analysis and digitising tool that can be used by anyone, anywhere and with minimum training. Increasing productivity across all industries. The ROMER proprietary software RDS features SMART technology, allowing total management of checks in the field as well as temperature and shock monitoring. 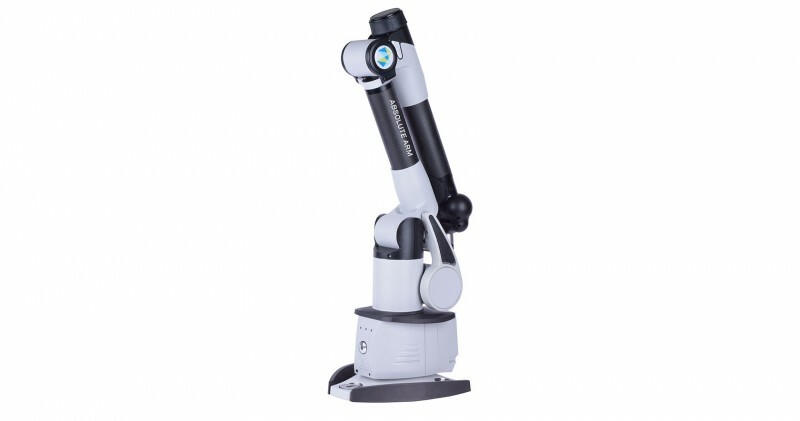 The ROMER Absolute Arm is available with a completely integrated high-performance laser scanner or the external HP-L-20.8 scanner, for complex scanning tasks. ROMER Absolute Arms are the only scanning systems on the market to offer fully verifiable scanning system accuracy. Intelligent Quick Change Probes: Swap touch-probes at any time without the need to recalibrate. 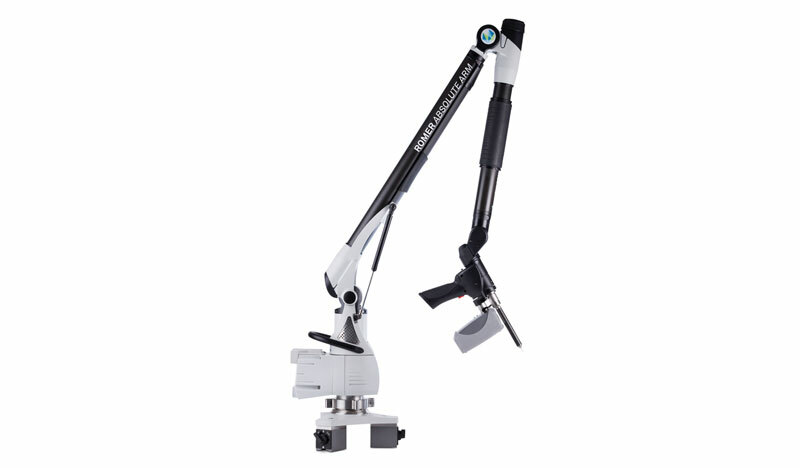 The Romer Absolute Arm’s repeatable mount allows to change probes on the fly, according to your measurement needs. The ROMER Absolute Arm provides immediate acoustic and haptic feedback to the operator, allowing the Romer Absolute Arm to be used in even the most harsh industrial environments. Referencing and warm-up time was for yesterday – just switch the arm on and measure. Size does matter: The ROMER Absolute Arm is available in seven lengths between 1.2 m and 4.5 m.
All ROMER Absolute Arms including scanning systems pass through B89.4.22 certification. Additional certifications according to VDI/VDE 2617-9 are also available. 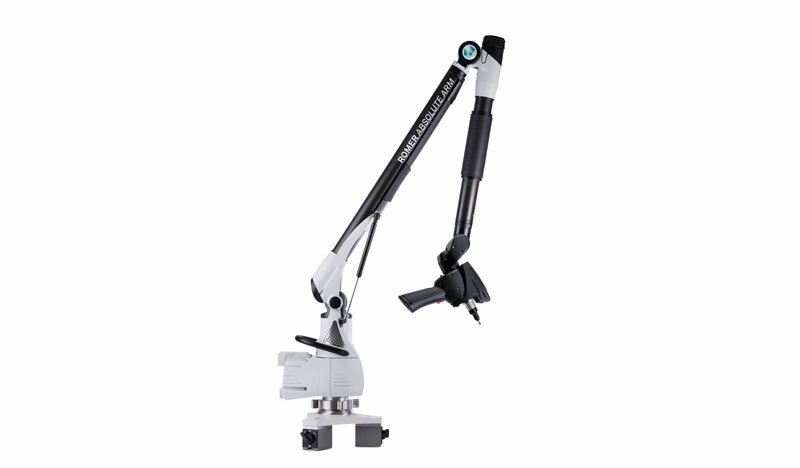 The ROMER Absolute Arm Compact model is available with a choice of ISO 10360-2 or B89.4.22 certification. Zero G counterbalance eliminates torque in the base and arm members, more forgiving of the arm being mounted in a vertical position and puts you in control of the arm. If the Romer Absolute Arm is not in use it can be locked safely into its rest position. SmartLock also allows the arm to be fixed in any intermediate position. 1 The Point Repeatability Test is the reference test to determine measurement arm repeatability with ball probe. The cone is in front of the machine. Points are measured from multiple approach directions. The average point and the deviation of each point to the average center are calculated. The result is the maximum range divided by two. 2 The Volumetric Accuracy Test most accurately represents the reasonable expectations for machine performance in practical measuring applications since it involves measuring a certified length standard many times in several locations and orientations and compares the resultant measurements to the actual length. The Volumetric Length Accuracy Test is the most appropriate test for determining machine accuracy and repeatability. The result is the maximum deviation of the measuring distance less the theoretical length. All probing specifications are achieved with a ROMER Absolute Arm mounted on a ROMER base plate or magnetic base and using a 15 mm steel ball probe with a length of 50 mm under stable environmental conditions. Offering accuracy for even the smallest of jobs, the ROMER Absolute Arm Compact brings high-tolerance 3D measurement to the shop floor. A faster and more accurate alternative to manual measurement tools, this versatile portable coordinate measuring machine (CMM) can perform numerous tasks around the workshop, making it the perfect complement to stationary CMM equipment. With a measurement volume of up to 1.2 metres and a choice of ISO 10360-2 or B89.4.22 certification available, the ROMER Absolute Arm Compact is easy to integrate into quality control processes. Capable of operating without mountings and with no need for referencing, the system is quick to setup and easy to use, providing a multipurpose measurement tool for users at any level of experience. With the RDS system software inside, the ROMER Absolute Arm Compact is compatible with all major metrology software packages including the intuitive and highly-accessible PC-DMIS Touch – ideal for shop-floor users. Compatibility with ROMER Absolute Arm feature packs allows wireless communication and battery operation, minimising setup time and making the ROMER Absolute Arm Compact ideal for measuring on the move. The ROMER Absolute Arm Compact is compatible with the full range of probes and accessories from the ROMER Absolute Arm range, offering great flexibility and ensuring users always have the right tools for the job. Selecting a certification: is B89 or ISO better? The ROMER Absolute Arm Compact is offered with a choice of two certifications: B89.4.22 or ISO 10360-2. Each certification quotes the arm accuracy in a different way. B89 is the standard certification typically used for PCMMs and quotes the arm performance (volumetric accuracy and point repeatability). ISO certification is a stationary CMM type certification that quotes the arm accuracy according to a variable ‘L’, where ‘L’ is equal to the length of measurement that is being performed. The longer the measurement, the higher the L value and therefore the lower the measurement accuracy. 3D digitizing, 3D modelling, point cloud inspection, reverse engineering, rapid prototyping or copy milling: this system is an all-purpose metrology tool for a multitude of applications. Freedom of movement: with a fully integrated and certified RS3 laser scanner, this is an all-purpose metrology system for almost any measurement need. Point cloud inspection, product benchmarking, reverse engineering, rapid prototyping, virtual assembly or CNC milling are just some of the typical laser scanning applications that can be added to the rich portfolio of touch-probe measurement applications. The integrated laser scanner is designed to capture data from almost any object surface. It does not need warm-up time or additional cables and controllers. Scanner and probe measurements are combined in the same software session.Increasing productivity across all industries. Thanks to easily interchangeable Feature Packs, the functionality of the Romer Absolute Arm can always be enhanced. Feature packs are available for wi-fi comunication, wi-fi scanning capability and full battery operation. 7320SI/SE 2.0 m / 6.6 ft. ± 0.044 mm / 0.0017 in. ± 0.061 mm / 0.0024 in. 0.079 mm / 0.0031 in 8.3 kg / 18.3 lbs. 7325SI/SE 2.5 m / 8.2 ft. ± 0.049 mm / 0.0019 in. ± 0.069 mm / 0.0027 in. 0.084 mm / 0.0033 in. 8.6 kg / 19.0 lbs. 7330SI/SE 3.0 m / 9.8 ft. ± 0.079 mm / 0.0031 in. ± 0.100 mm / 0.0039 in. 0.119 mm / 0.0047 in. 8.9 kg / 19.6 lbs. 7335SI/SE 3.5 m / 11.5 ft. ± 0.099 mm / 0.0039 in. ± 0.125 mm / 0.0049 in. 0.147 mm / 0.0058 in. 9.2 kg / 20.3 lbs. 7340SI/SE 4.0 m / 13.1 ft. ± 0.115 mm / 0.0045 in. ± 0.151 mm / 0.0059 in. 0.181 mm / 0.0071 in. 9.5 kg / 20.9 lbs. 7345SI/SE 4.5 m / 14.8 ft. ± 0.141 mm / 0.0056 in. ± 0.179 mm / 0.0070 in. 0.214 mm / 0.0084 in. 9.8 kg / 21.6 lbs. 75 Series 7520SI 2.0 m / 6.6 ft. ± 0.023 mm / 0.0009 in. ± 0.033 mm / 0.0013 in. 0.058 mm / 0.0023 in. 8.6 kg / 19.0 lbs. 7525SI 2.5 m / 8.2 ft. ± 0.027 mm / 0.0011 in. ± 0.038 mm / 0.0015 in. 0.063 mm / 0.0025 in. 8.9 kg / 19.6 lbs. 7530SI 3.0 m / 9.8 ft. ± 0.042 mm / 0.0017 in. ± 0.058 mm / 0.0023 in. 0.083 mm / 0.0033 in. 9.2 kg / 20.3 lbs. 7535SI 3.5 m / 11.5 ft. ± 0.055 mm / 0.0022 in. ± 0.081 mm / 0.0032 in. 0.101 mm / 0.0040 in. 9.5 kg / 20.9 lbs. 7540SI 4.0 m / 13.1 ft. ± 0.067 mm / 0.0026 in. ± 0.098 mm / 0.0039 in. 0.119 mm / 0.0047 in. 9.8 kg / 21.6 lbs. 7545SI 4.5 m / 14.8 ft. ± 0.084 mm / 0.0033 in. ± 0.119 mm / 0.0047 in. 0.138 mm / 0.0054 in. 10.1 kg / 22.3 lbs. Probing Dispersion value* P[Form.Sph.D95%:Tr:ODS] n.a. 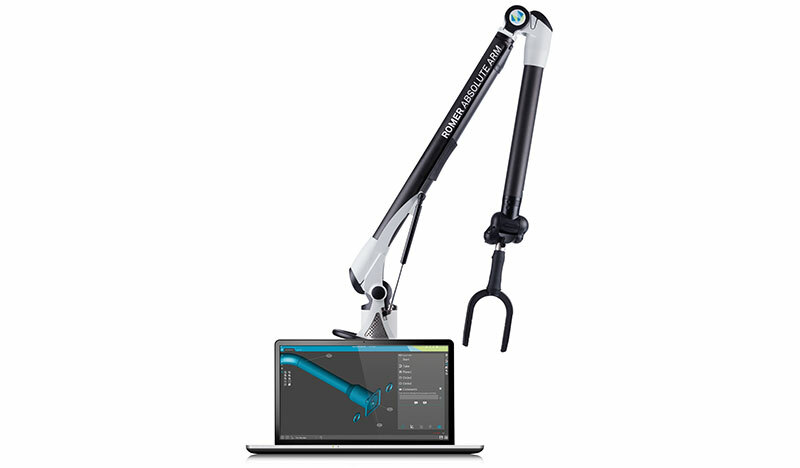 3 SI designates the ROMER Absolute Arm with integrated scanner. 4 The Scanning System Accuracy Test most accurately represents the reasonable expectations for machine performance in practical measuring applications while using the laser scanning method. The test consists of measuring a matte grey sphere with 5 different arm articulations. In each articulation of the arm the sphere is scanned from 5 different directions such that the majority of the sphere is scanned. The result is the maximum 3D center to center distance of the 5 spheres. All RS3 scanning specifications are achieved with a ROMER Absolute Arm mounted on a ROMER base plate or magnetic base and a matte grey calibration sphere of 25.4 mm diameter under stable environmental conditions. The ROMER Absolute Arm with external scanner is designed for the high performance laser scanner HP-L-20.8 from Hexagon Metrology. The ROMER Absolute Arm with external scanner is the high-end laser scanning platform designed for the HP-L-20.8 laser scanner from Hexagon Metrology. 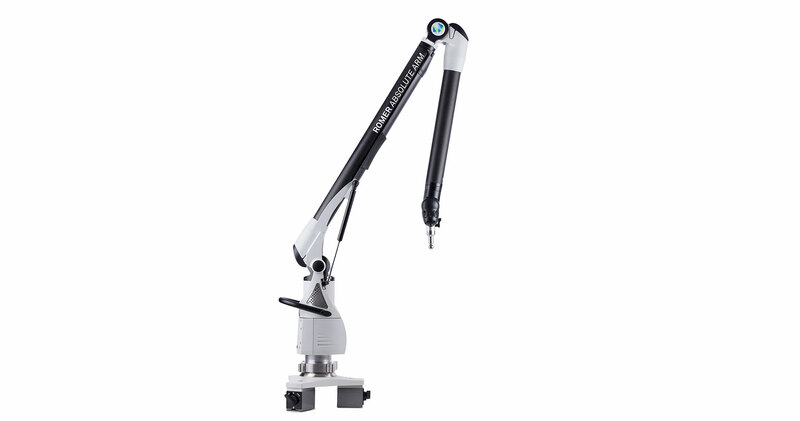 With HP-L-20.8, the ROMER Absolute Arm offers first-class performance on the most complex surface types. Automatic laser control means that multiple surface colours can be scanned in a single pass. Thanks to the HP-L-20.8’s unique flying dot technology, the scan width and point density are entirely variable, allowing the user to guarantee maximum scan detail where it’s needed most. Thanks to easily interchangeable Feature Packs, the functionality of the ROMER Absolute Arm can always be enhanced. Feature packs are available for wi-fi communication, wi-fi scanning capability and full battery operation. * The Scanning System Accuracy Test most accurately represents the reasonable expectations for machine performance in practical measuring applications while using the laser scanning method. The test consists of measuring a matte grey sphere with 5 different arm articulations. In each articulation of the arm the sphere is scanned from 5 different directions such that the majority of the sphere is scanned. The result is the maximum 3D centre to centre distance of the 5 spheres. Available as a turnkey hardware and software package, or as an upgrade to existing portable measuring arm units, the system uses the powerful ROMER Absolute Arm portable coordinate measuring machine (CMM) alongside specially designed non-contact tube probes and the state-of-the-art TubeShaper software to accelerate the measurement and inspection process, with the absolute minimum of intervention. 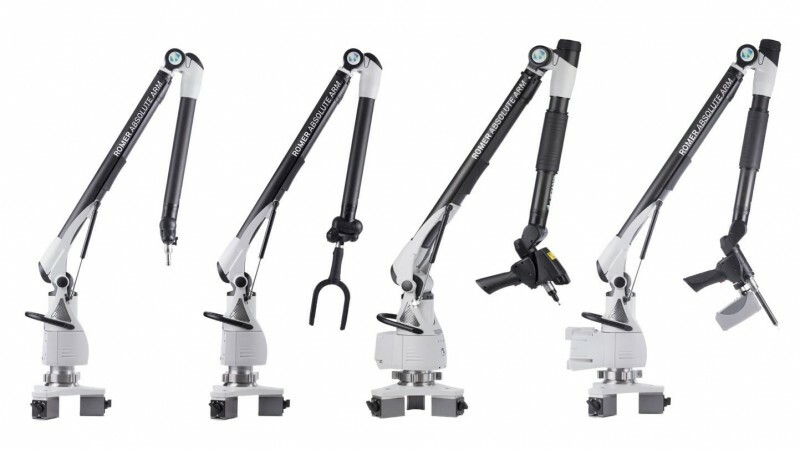 The easy-to-handle ROMER Absolute Arm uses non-contact tube probes, available in six different sizes, to measure tube length and bend angles as XYZ, LRA or YBC values, while standard touch probes ensure that full tube assemblies – including any welded fixtures like brackets or hangers – can be measured. The state-of-the-art TubeShaper measurement software has been designed specifically for tube inspection with the ROMER Absolute Arm, and represents a totally new beginning in software use in this sector. Using a completely original interface, TubeShaper has been designed with some of the world’s leading tube producers to create a product that brings you valuable measurement and process information as simply and quickly as possible. CAD models of tubes and tube assemblies can be imported directly, while interfaces to CNC tube bending machines ensure real-time correctional data is transmitted directly to the bending machine itself. Measurement plans can be created offline prior to measurement, or even automatically during first-part inspection. These routines can be recalled and run at any time, meaning that batch measurement is both fast and easy. All measurement data can also be exported in IGES file format for reverse engineering applications, without the need to manage complex point cloud data. Tube measurement has never been so complete. With ROMER Absolute Arm sizes ranging from 1.2 m to 4.5 m, two dedicated ‘T’ models for specific tube application and six tube probe options covering tube diameters from 4 mm to 130 mm to choose from, it’s easy to select the right size Tube Inspection System for your workpieces. All measurement probes can be swapped within the same software session, with no need to recalibrate between changes. Simply switch from tube probe to touch probe on the fly, according to what you need to measure next. Perfectly-weighted counterbalancing ensures that the ROMER Absolute Arm is a pleasure to use, even for an entire 8-hour shift. The lightweight Tube Inspection System can be moved around your facility in minutes, to where it’s needed most. A full range of accessories including additional tube probes, tube clamps, measurement tables and raisers mean that your Tube Inspection System can be configured to suit your working environment and application requirements. Featuring a totally original user interface, TubeShaper has two access levels for users of different profiles. The Engineering Interface allows full use of all TubeShaper functions, while the Shop-floor Interface is designed for high-speed measurement. Larger icons enable control through the ROMER Absolute Arm, accelerating use and reducing trips to the computer. Real-time direct interface to CNC tube benders enables correctional data to be calculated and applied within your production cycle, streamlining operations and almost completely eliminating scrap. Multiple bending machines can be supported by a single Tube Inspection System. Every time a new tube is measured it is automatically saved as a measurement plan, which can be run later at any time. Measurement plans can also be defined offline prior to measurement, meaning your intervention time on the shop floor is reduced yet accuracy and repeatability are guaranteed. Measurement reports can be created automatically and presented in the format you need, enabling you to monitor tube bender performance over time and spot problems on the shop floor before they become critical. CAD models can be imported into TubeShaper in IGES and STEP formats as standard, while other popular CAD formats are also optionally available. For reverse engineering applications, tube and geometric data can be exported as an IGES or SV file. The ROMER Absolute Arm and tube probes are certificated to B89.4.22 as standard. Certifications to VDI/VDE 2617-9 are also available on request. The ‘T’ Series of the ROMER Absolute Arm is designed for the tube industry, and features a stronger counterbalance for faster tube measurement and improved ergonomics. It is available in two measuring volumes: 2.5 m and 3 m.
The standard ROMER Absolute Arm is more suited to customers who need to measure more complex parts like brackets, flanges and fixtures. Choice of ROMER Tube Probe: There are 6 sizes to choose from according to the diameter of the tubes you need to measure. All ROMER Tube Probes are compatible with all ROMER Absolute Arm models. Measurement volume (Standard ROMER Absolute Arm): 1.2 m-4.5 m (3.9 ft.-14.8 ft.). Measurement volume (ROMER Absolute Arm ‘T’ Series): 2.5 m or 3 m (8.2 ft. or 9.8 ft.). All specifications according to B89.4.22. Certification is also available to VDI/VDE 2617-9.